I hate to mess up my kitchen on cleaning day. Any other day of the week, I can handle, but not today. My preference is to go out when the house has just been cleaned, but to find a place that is tasty and reasonably priced is often difficult and then we can never figure out where to go. The solution is to find an easy and clean way to cook without having too much clean-up to do. So on the way home I got the bright idea of making brisket, ‘the easy way’. I purchased a small portion (about 2 lbs) of Choice Grade Brisket that was well trimmed. Took it home and put it in the most used piece of my cookware, an oval stainless (copper bottom) casserole with lid and rack. The meat went on the rack and I covered it with[amazon Lipton’s Onion Soup mix (a very handy item to have around) and poured over that a cup of Madeira Wine. I surrounded the brisket with two white rose potatoes which I cut into lengthwise fourths. Also around the meat went half a dozen large mushrooms which I cut into fourths and four whole small carrots. Put the cover on and then put it into a 350 degree oven. The meat was cooking while the house and kitchen were being cleaned and will continue cooking until dinner time. This will give it about 3 ½ hours to cook, which should be just enough to cook brisket under moist heat conditions. At 6 PM the brisket will come out of the oven and will rest for about 15 minutes while I prepare a salad to go along with it. 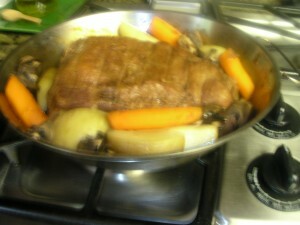 but the preparation was very simple and will give us enough leftovers foranother meal or sandwiches. And the cleanup is simple! All I had to do was rinse the few dishes we used and set them in line for insertion in the dish washer. I rinsed out the cooking pan, filled it with hot water and soap to soak. Soaking hint! Use dishwasher detergent. Stainless cookware is the easiest to clean just by letting it soak for a little while. When you buy stainless, be sure that it has a copper or alumium bottom for good conductivity. Stainless is easy to clean but by itself is not a good conductor of heat!